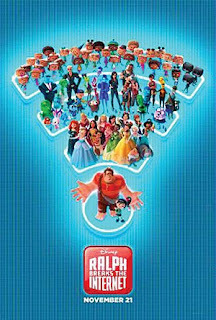 guaranteed to like the second movie, “Ralph Breaks the Internet.” Disney did it again, creating a comical, and enjoyable film for all ages. 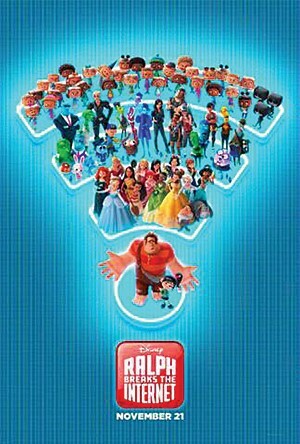 Briefly, “Ralph Breaks the Internet” is a 3D computer-animated comedy produced by Walt Disney Animation Studios that features the returning voices of John C. Reilly, Sarah Silverman, Jack McBrayer, Jane Lynch, and Ed O'Neill with Alan Tudyk also returning but voicing a new character. There were a few new additions to the cast including Gal Gadot, Taraji P. Henson, Bill Hader, and Alfred Molina. The story goes that six years after saving the game Sugar Rush from Turbo's revenge, Wreck-It Ralph and Vanellope von Schweetz are still best friends who hang out every night after work in Litwak's Family Fun Center and Arcade. Before long, Vanellope gets bored with the predictability of the game so Ralph tries to give Vanellope something to look forward to by building her a new steering wheel. Unfortunately, the game player accidentally breaks Litwak's game. And the adventures begin as they journey through various spaces of the Internet. Even though a fun kids movie, directors Rich Moore and Phil Johnson still seemed to incorporate a friendship theme along with a lesson – which is - if a friend moves to a different place, don't hold them back even if you want to let them spread their wings and fly. Something I really loved about this movie was how the filmmakers brought the internet alive - everything from buildings representing Facebook, Pinterest, and Ebay to the pop up that represented spam. Overall, this was a really well put together movie and if you haven't seen it yet, I would highly recommend it for everyone, young and old alike.